Loyal Android Wear users are dismayed that the first new Qualcomm silicon for smartwatches in three years uses ancient technology – and won't offer the gains in performance they were hoping for. Qualcomm has launched its Snapdragon 3100 system on a chip for smartwatches, the first platform update since the 2100 in early 2016. Qualcomm had trailed the announcement by describing it as the first smartwatch chip built "from the ground up". But it doesn't appear to be as radical as some had hoped. With Apple, Huawei and Samsung moving to a 7nm manufacturing process for their wearable chips, the Snapdragon 3100 retains the 28nm process used in the 2100. Qualcomm has also held on to the 32-bit quadcore A7-based design used in phones and wearables since 2011 – although this is now augmented by an ultra low power co-processor, the Qualcomm QCC1100, allowing the display to operate while the four A7 cores are asleep. The new co-processor can also handle sensor I/O and GPS, offloading the work from the four A7 cores. Qualcomm claimed "typical battery life day of use improvements ranging from four to 12 hours compared to the previous Snapdragon Wear 2100 platform, depending on display type, battery capacity, and device configurations" and that the sports mode should help a smartwatch last some 15 hours. Intensive use of GPS depletes a battery rapidly on any platform. "Smartwatch users actively interact with their smartwatch only 5 to 10 per cent of the day. The other 90 to 95 per cent of time, users simply expect the smartwatch to be always on and always sensing," Qualcomm explained, justifying its design decision. 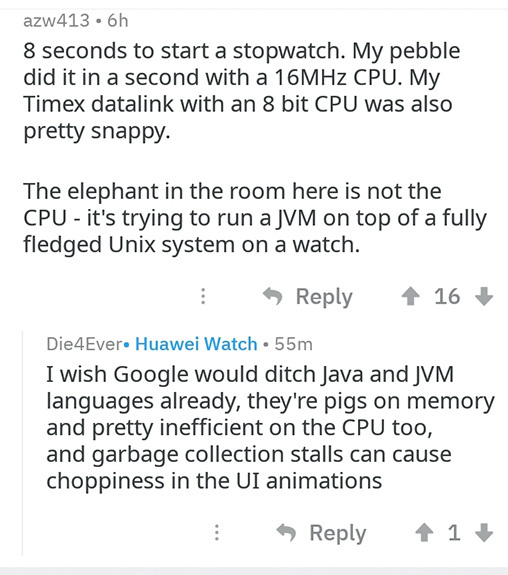 So there should be substantial power savings from this design – but not leaps in performance, which on the Java-based Wear OS (formerly Android Wear) has never been great. Unlike Samsung's Tizen and Apple's WatchOS, Google's Android is relatively inefficient, and the sluggish performance has been a bugbear of loyal owners for years. A year ago Apple touted a 70 per cent year-on-year performance improvement for the Watch 3 (teardown here), thanks to the third-generation (12nm process) S3 chip. The fourth-gen Watch is expected to be unveiled tomorrow. But perhaps Google's remaining Wear OS customers don't mind – they don't sell to techies. Google now targets Wear OS at high street fashion brands. Fossil, Louis Vuitton and Montblanc promised to market watches based on the 3100. If those customers are getting out of the gym without a flat watch, that's an improvement.